By May 8, 1945, World War II in Europe had ended with Allied victory, but the Pacific theater was yet to see its deadliest days. An important theatre in World War II was the Pacific War (also known as Asia-Pacific War) from 1941 – 1945. Japan was seeking to create a great Empire in Asia, on December 8, 1941 Japanese forces attacked the American naval base at Pearl Harbour (where it was still December, 7) as the United States were the only country with sufficient naval forces to oppose Japan in the Pacific. In response, the United States declared war on Japan. After the attack on Pearl Harbor, Japan achieved a long series of military successes until the Japanese invasion fleet was defeated in the naval Battles. The Allies reached their turning point with the defeat of the Japanese at Guadalcanal in February 1943. Until the formal surrender of Japan on September 2, 1945, a great number of battles were fought both on sea and land. Both sides suffered heavy losses and casualties. 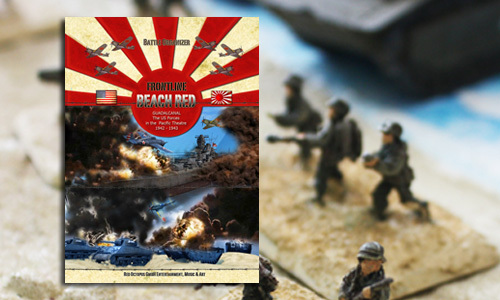 Based on historical facts the books cover this period and create briefings for playing Allied/US and Japanese tabletop armies and enable wargamers to refight the famous battles in Burma, the Philippines, the East Indies, Solomon Islands and New Guniea, including Guadalcanal, Bourgainville and at last the Gilbert Island campaign with the battle of Tarawa, the landing on Betio Island in November 1943, the battles for Saipan 1944 and Iwo Jima 1945. 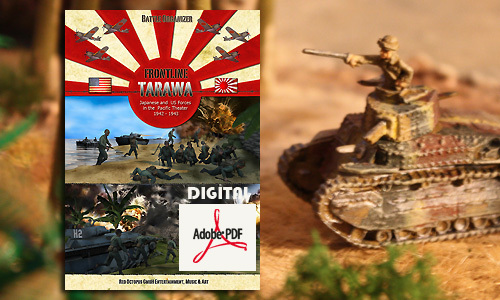 You can choose from various lists and historical briefings for appropriate company sized battles for any size of tabletop miniatures from 1/100 to 1/72 or 28mm. 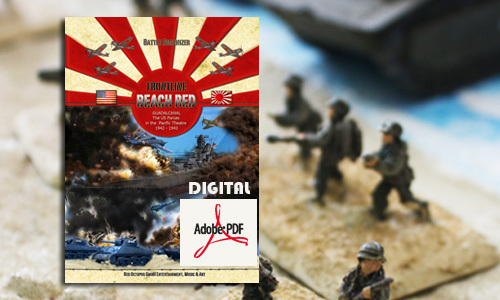 In the books and in our apps we includeded all you need to set up your armies for this specific Pacific theatre. You can configure your company with a typical HQ, Combat and Weapons Platoons and of course some support units. 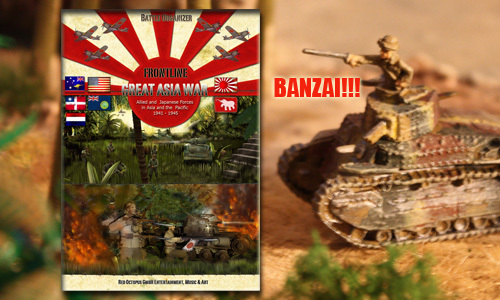 You find all this in full overview on the company diagrams, with special rules, point values and more to use for many rule systems and, of course, our Core Rulebook for the Pacific and South East Asia. 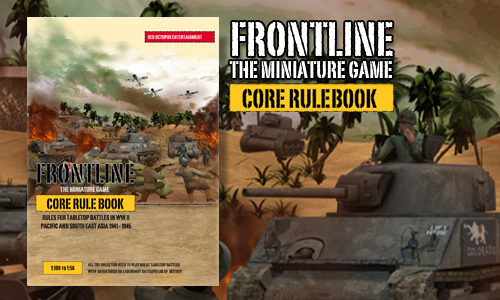 NEW December 7, 2018: Frontline Miniature Core Rulebook! 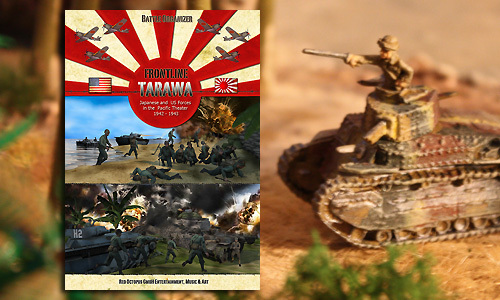 This book contains all the rules you need to play great battles in the Pacific theatre from 1941 to 1945 with your miniatures in size from 1:100 to 1:56! Quick look into the books and more! Quick look into the rulebook! Find more content, downloads and information in our Frontline Forum! Printed Books: 21 days of delivery - print on demand books. 126 pages, PDF in full colour. 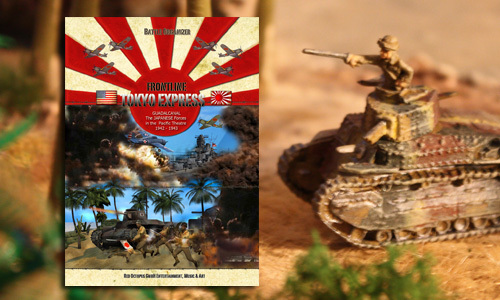 Contains all Core Rules for playing great tabletop war games and air combat, US and Japanese lists for Wake Island Scenario, special rules for armies in the Pacific from December 1941 to 1945. Have a quick look into the book! 214 pages, hardcover book, printed in good quality and in full colour. 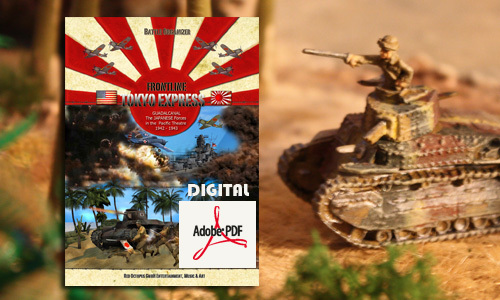 Contains Allied lists and Japanese lists, special rules for the armies, story parts about the settings and the historical battles from December 1941 to 1945 between Allied and the Japanese forces. A quick look into the books! 214 pages, PDF, in full colour. 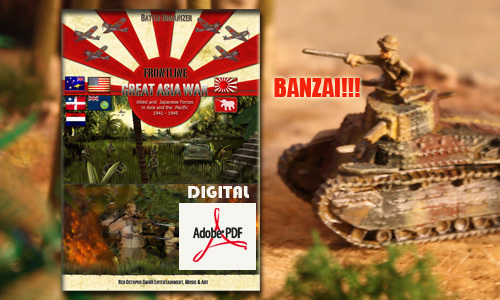 Contains Allied lists and Japanese lists, special rules for the armies, a story part about the setting and the historical battles from December 1941 to 1945 between Allied and the Japanese forces. Quick look into the book and more! 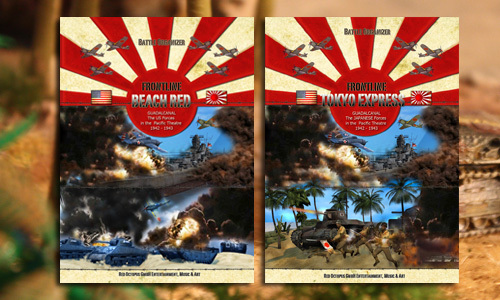 "Frontline - Beach Red & Tokyo Express"